A sheet pan meal packed with flavor! 2. In a small bowl, combine 1/4 cup chipotle peppers, thyme, honey, garlic powder and olive oil. Stir to combine. 3. Place Brussels sprouts in a separate bowl and toss with 1 tablespoon chipotle mixture. Arrange Brussels sprouts in a single layer on foil lined baking sheet. 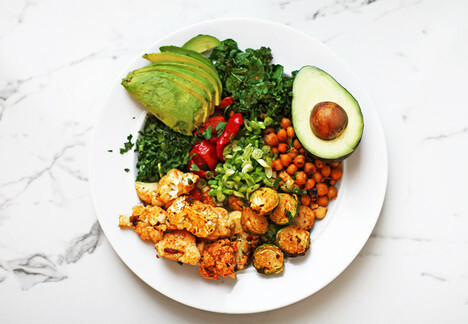 In the same bowl, repeat this process for red peppers, garbanzo beans, cauliflower and kale adding 1 tablespoon of chipotle mixture to each ingredient separately, toss to coat completely. Arrange each ingredient separately in a single layer on baking sheet. 4. Place baking sheet in oven and roast for 15 minutes or until all vegetables are golden brown and tender. 5. For the dressing, whisk together remaining 1 tablespoon chipotle peppers, hummus, lime juice and water; reserve. 6. Assemble the bowls by dividing roasted vegetables into two separate bowls, each ingredient should have their own separate space. Drizzle reserved dressing over ingredients and garnish each bowl with green onions, parsley and avocado. Season to taste with salt and pepper. Tip. If the spicy hummus is too spicy, replace it with your favorite flavor hummus!